Start with the first two stages of Dance Mat Typing to warm up & review the home row. 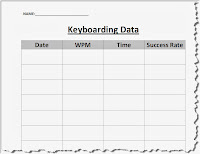 Then record your results on this form in lesson 1 and lesson 2 at Sense-Lang typing. Finish up with some fun at "Upbeat" typing game.